Custom Fascia and Spouting are experts in downpipe installation and repairs. Whether the building is existing or brand new, we will find the right spouting, downpipe and fascia board system to suit any decor and budget. All of our downpipe installations are covered by our minimum 10 year warranty. To view product colours please view our online colour chart here. Contact Auckland downpipe specialists today for a free measure and quote! Our team of experienced and knowledgeable workmen are equipped to offer rainwater downpipe repair services throughout Auckland and Bay of Plenty. Regardless of your existing downpipe style, we can ensure your repairs look as good as new. We guarantee our workmanship on all downpipe repair services. Contact us today to request downpipe repair quote. 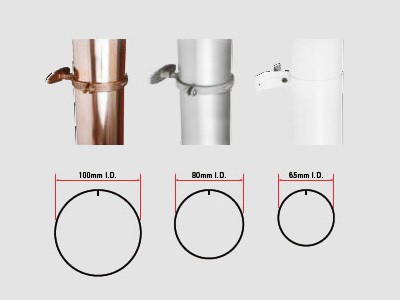 Our standard downpipes are available in 65mm, 80mm, 100mm and 150mm sizes and are supplied in varying lengths to meet requirements. We can also manufacture in square, rectangle or build something custom to suit your application. We offer and install downpipes in materials such as colorcote, copper, aluminium, titanium zinc, stainless steel and PVC and will do our best to ensure you get the right material and colour to suit your home. Very pleased to have this job completed. Looks really good. This follows over 12 months of trying to get other contractors to realistically quote and commit to completing the job. Thank you Custom Fascia and Spouting for your commitment and for the quality of your work. Looking for Downpipe Installation or Repair Services in Auckland?